Change - a little at a time... and often! Introduce change into your life frequently - a little at a time - and often. This gives you time to adapt from the 'old' ways and to become skilled with the 'new' - and it makes life more comfortable for those around you! We're in a world of instant results. People can have complete image 'makeovers', home or garden makeovers, or even life makeovers during a 45 minute (including adverts) television programme. So the promise of the Grand New (Instantly Successful) Start is hard to resist. But, as many of us have discovered, these Grand New Starts don't tend to produce lasting changes and often upset the people around us. This is because they often upset our 'personal ecology' - provoking a backlash. And this is because Grand New Start often causes disruption in our lives and in our relationships which can result unexpected consequences. And these unforeseen side-effects often cause us to give up the new start pretty quickly. Comfort Zone: This is our area of familiarity and sameness - doing familiar, routine activities with which we are very comfortable e.g. same route to work, same food for lunch, same way of spending your evening. Stretch Zone: Now we're doing something a little unusual or out of the ordinary. This can be mildly stretching, such as a slight change in daily routine. Or it can be quite stretching as in making major changes in daily routine, starting a new job, or even going to a new holiday destination. Panic Zone: is the one to avoid; it's where we stretch too far - to the point where change in activity is unpleasantly, rather than exhilaratingly, stressful. Panic Zone activities often result in a 'never again' decision. 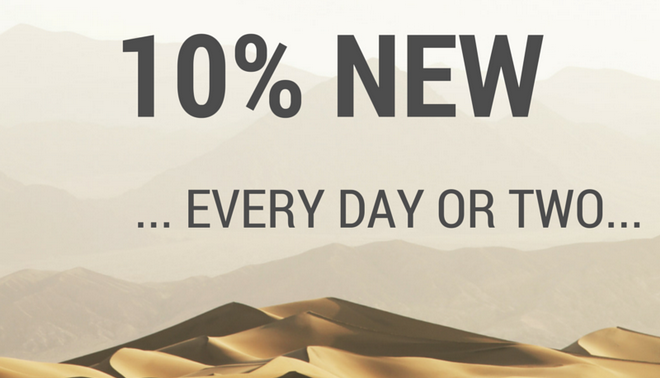 With 10% New we aim to respect ourselves by stretching in small increments rather than making life disrupting changes. We aim to gradually develop skills and familiarity - rather than suddenly shocking our system with a 'stretch too far'. Importantly, this principle also encourages us to respect what other people select as their 10% New stretch - an important skill in managing, coaching, parenting, or even in simply being a friend to someone. These two principles, plus Challenge by Choice, set the framework for how people participate in the High or Low Ropes Challenge courses and how they interact with one another through the entire course. The principles ensure that participation is enjoyable, is quite free of peer pressure, and is an opportunity to demonstrate respect for oneself and for others. The value of these two concepts is not restricted to the Ropes Courses nor to NLP training; they have valuable applications just about everywhere in our daily lives. Here we're looking at what appears to be the least insignificant of the two concepts - the '10% New' principle - because this is a great example of the simple being powerful. This apparently simplistic concept is one which, months or years after participating in one of our courses, people refer back to as having had an enduring effect - despite the fact that actual introduction of the principal took around 15 minutes of course time! We've probably all done it: we read an inspiring book, watch a TV programme or YouTube video, or attend a workshop and decide 'that's it - time to change my life!' Full of enthusiasm we embark on our crusade to radically transform our own lives - and maybe even the lives of friends and family. And usually this Grand New Start, this excursion into the outer limits of our Stretch Zone, is so disruptive of our life that it creates a backlash. This quickly brings thing back to normality - back to the status quo - and we return to our Comfort Zone! This is The Grand New Start which leaves you so exhausted after a week or two that it disrupts your normal life and is soon quietly and guiltily abandoned. Which leaves you so hungry and miserable after a few days that you're soon back to the old ways. The Grand New Start in which I'm going to become be super-efficient and organised' but which is quickly abandoned because you spend more time being efficient and tidy than being productive! This begins with 'Right, we as a team are going to radically improve our performance (or have shorter meetings, use less paper, etc etc)'. and it so disrupts normal smooth team functioning that it has to be abandoned. 'We, as a household, are going to eat healthily (or start exercising, or going out for walks together, or going watch less TV, etc)' - a dream which quickly buckles under the strain of the disagreements, sabotage efforts or rebellions. What's common to each of these Grand New Starts is an enthusiastic beginning followed by lots of routine-disrupting activity which produces resistance or sabotage which, in turn, results in the project being abandoned! This occurs because dramatic changes, i.e. very big Stretches, disrupt the 'system' or the established status quo so they provoke resistance or a backlash. Or provoke a relentless on-going struggle with ourselves - in the case of personal stretches. Or a struggle with others because we are attempting to impose our ideas on them. 'Little and often' rather than a lot occasionally is much more likely to be effective, enduring and enjoyable! That's because with a measly '10%' improvement there's almost no disruption - and so there's no backlash. But.. these small and almost imperceptible changes usually become (pleasantly and gradually) life changing. Rather than the Great Fitness Programme how about walking for 10-15 minutes more per day for the first week or three? Instead of the Super New Weight-Loss System how about aiming to gradually reduce the size of food portions - and aiming to always leave a little food on the plate? Instead of the 'I Will Become Perfect' Programme how about beginning with just one daily task that you will do differently and more effectively - and then sticking with this until it becomes a habit? Rather than the This Team/Household Will Improve how about agreeing on specific small improvements which are persisted with until they become habitual? Keep It Short & Simple by picking one little change and sticking with it for a few days. Not for the rest of your life. ...and after the five or six days it's likely it won't be so much in your Stretch zone - it'll have slipped silently into your Comfort Zone - and becoming part of your routine.